We just launched the first ever Silverlight-based Survey Design Tool. You can now design and publish email survey invites through the JangoMail interface and view your survey results for each individual participant. 1. Click on the new Surveys tab. If you don't have Microsoft's Silverlight Platform installed, you will be prompted to install it at this time. Survey recipients see the survey on a regular webpage and will not need to download Silverlight. 2. Click the Create a New Survey button to get started. Then choose the Blank survey option. 3. To create a new question, click in the box under Create a new item. Edit the question and answer points by deleting the text that is currently there and typing in your own. To use a pre-defined set of answers, click the down arrow next to your answer set. To add space for short text answers and comment sections, click on the down arrow in the box under Create a new item. Then click on the type of answer you would like. 4. When you are done creating your survey, click the Save button. 5. To make the survey available for people to respond, you must publish it. Click on the Publish tab and then click Publish Survey. Here you will get a link that you can send to people to fill out your survey. 6. Set your survey to end by navigating to the Close tab and entering in when the survey should close. You can choose to end it immediately, on a certain date, or after a given number of responses. 1. When you publish your survey you will be provided with a link. Copy that link. 2. Create an email message in the Messages section as you normally would. Paste in the link that you copied where appropriate. After testing your email and your link, send the email out to your survey list. View Recipient-Level Results by clicking on My Surveys in the Surveys section. Click on the Results button next to the survey that you would like to view results for. We will soon add results in our Reporting and Analytics section as well. Our new no-frames user interface is ready to be tested. To switch to the no-frames interface, login to your account and click the "Switch to No-Frames" link. You can always switch back to the old frames interface if you want to later. The "Account Info" section is no longer a main tab. It is a link in the top area. The "Help" section is no longer a main tab. It is a link in the top area. There is a new tab called "Surveys". You can now design and publish and email survey invites to your email lists. The Surveys feature is also in beta. The survey builder runs on Microsoft's Silverlight platform, so if you don't have Silverlight installed, the first time you click on the "Surveys" tab you'll be asked to install Silverlight. The new no-frames interface will now be the basis for a whole host of user interface improvements, including improved text styling, contextual help, more videos, easier navigation, and clearer organization. Stay tuned for these improvements and future blog posts on how to use Surveys. Email deliverability is a key concern for most email marketers, and at JangoMail, we think we do a pretty good job of ensuring the highest possible inbox placement of our clients' emails. JangoMail is a highly customizable platform, from sending speeds, to email headers, to SMTP protocol level customizations. Taking advantage of certain settings and features can help ensure high email deliverability. Some of these steps involve separating yourself from other JangoMail clients. It's not that JangoMail accepts spammers, but JangoMail does accept different levels of opt-in email marketing. For example, some customers use single opt-in, while other customers use confirmed opt-in. Generally, customers using confirmed opt-in experience higher deliverability. Therefore, different JangoMail clients have different reputations with ISPs, so if two clients are both using a username@jangomail.com From Address for example, they both can impact the reputation of the domain jangomail.com. Following the below steps will solve most email delivery issues to major consumer ISPs, like Yahoo, Hotmail, Gmail, and AOL. Use your own domain name in the FROM address. Brand your messages using your own domain name in the FROM address. This requires using an SPF record (see #5 below) that includes jangomail.com. If you use your_username@jangomail.com, the delivery of your messages is mixed in with everyone else using jangomail.com as their FROM address. All JangoMail accounts come with the option to use username@jangomail.com as the FROM address on email campaigns, but that's meant to help smaller volume users to get started, and is provided as a convenience to our clients. If you have your own domain name, use it - it only helps. a. In order to separate your reputation from other clients using jangomail.com as their FROM address, use an actual company (or based on your domain name/website) email address, such as john.smith@company.com. b. You can also send using a subdomain within your company, using an address such as marketing@newsletters.company.com. And, if you want JangoMail to handle reply management for that subdomain (our branded subdomain feature), let us know via a support ticket. Replies to your messages can be forwarded to an address of your choosing (replies normally go to the FROM address you used in your message). For instructions, see the PDF Setting up a Branded Sub-Domain. Use a custom tracking domain based on your domain name. The tracking domain is the domain referenced in the URLs for our open-tracking mechanism, click tracking, the unsubscribe link used in your CAN-SPAM footer, the forward-to-friend link, the view-as-a-web-page link, and other links that offer tracking in your email messages. By default, every JangoMail account is assigned a system tracking domain that is shared amongst multiple clients. Example names are x.jango5.com and x.jmxded92.net. By setting up your own tracking domain, you can isolate yourself from the activities of our other clients. 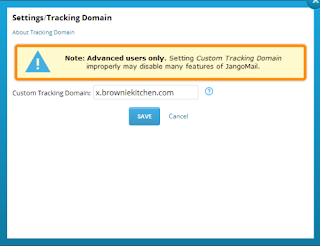 Create a CNAME record in your DNS that points to jngo.net (that's "jango" without the "a"). Then, go to Settings --> Tracking --> Tracking Domain and enter your tracking domain name. If your domain is mycompany.com, then setting up x.mycompany.com makes for the perfect tracking domain. A URL that looks more like you than us helps with your branding. See our blog article for more information. Use a Domain Key based on the domain name you use in your FROM address. Yahoo and other email providers look for DKIM signatures in the headers of email messages. The presence of a DKIM signature fosters a sense of trust that the email was sent by who was purported to send the email. To set up a domain key in JangoMail, see our PDF entitled Setting up DomainKeys/DKIM with JangoMail. Note: Yahoo requires that you have a "postmaster" address at your domain. After creating a DomainKeys/DKIM record, click the link in the confirmation email sent from Yahoo to postmaster@yourdomain. Whe you enable a new domain key in your accoutnt, we upload it to Yahoo so that they can process complaints properly and report them back to JangoMail via a "Feedback Loop." Yahoo has a special process where they send a confirmation email to postmaster@yourdomain, and that email message contains a link that must be clicked by you in order to activate the Feedback Loop. If you do not do this, complaints will not be properly reported, and your delivery to Yahoo email address may be negatively impacted by recipients that complain over and over and aren't added to your unsubscribe list. Add or edit the SPF record for your domain. An SPF record authorizes someone else (JangoMail, in this case) to send on behalf of your domain. This marks the "smtp.mail" header information with your domain, not ours, and messages sent to a gmail address, as an example, won't display "your_domain_name via jangomail.com." Instructions can be found in the PDF How to Publish SPF Records in JangoMail. If you're sending HTML email, make sure you include a corresponding plain text message. Spam filters tend to add a point or so to messages that do not include a plain text component. This is as easy as setting the Plain Text Message to "auto-generate" (see the screenshot below.) This will cause a plain text message to be generated (based on your HTML message) at the time of email sending. If the auto-generated message isn't good enough, you can also edit the plain text or simply create your own. Enroll in the Sender Score Certified program. In order to be accepted, you must have a complaint rate of 0 to 0.1%, plus meet some other requirements. Once enrolled, your emails are sent from IP addresses that are certified. Hotmail virtually guarantees inbox placement for emails sent from certified IPs, and Yahoo prioritizes emails sent from certified IPs. For more information on general JangoMail deliverability practices, see our Deliverability page on our web site. Additionally, there are simple steps that any email marketer can take with the content of messages to ensure high deliverability. The content-related issues are covered in the PDF document Optimizing Email Deliverability. Marketers can now create and edit Transactional Email Templates on the Send Email Page and without the help of their IT team. To enable this, we launched a new API method: SendTransactionalEmailFromTemplate. Instead of passing the full details of the email message using the regular SendTransactionalEmail method, you can now simply pass the email Campaign ID and let your marketers use the JangoMail interface to dictate the email's creative content. SendTransactionalEmailFromTemplate works like the SendTransactionalEmail method, but does not require you to enter FromEmail, FromName, Subject, MessagePlain, and MessageHTML. Instead you must enter CampaignID, PersonalizationValues, PersonalizationColDelimiter and PersonalizationFields. Marketers should create an Email Campaign as they normally would, starting on the Send Email Page (or just use the SendMassEmail API method). Once they create a campaign and send a test, you can find the Campaign ID in the Reporting and Analytics section of the JangoMail interface. Look in the ID column to find the Campaign ID. The single email address to whom you want to send this email message. The second version of the personalization syntax can be used in cases where the value of FieldName is blank, such that a default value is substituted instead of a blank. A comma separated list of name/value pairs. The names of the various options and their associated values are explained below. Your order has shipped. Your order number is %%OrderNumber%%. To test the operation using the HTTP POST protocol, visit the JangoMail API page on this method and click the Invoke button. Q. What's the difference between SendTransactionalEmailFromTemplate and SendTransactionalEmail? A. When calling SendTransactionalEmail, you are passing in the full details of that email message, including the Subject, the HTML Message, the Plain Text Message, tracking options and much more. However, if you've already created a template message in the Send Email section of the JangoMail web interface, you can call SendTransactionalEmailFromTemplate to send transactional emails and avoid having to pass in all the message details on every method call. You simply reference the Campaign ID of the email message that you created in the Send Email section. Q. I see there's a PersonalizationColDelimiter input paramter. Where is the PersonalizationRowDelimiter input parameter? A. Since this is a method to send a single transactional email, only one set of values can be provided for the single recipient of the email message. There is no need for a row delimiter since the data should only be for one record. Q. What is the TransactionalGroupID? A. This is an optional setting that can be specified as part of the Options input parameter. Transactional Groups are a way to categorize different types of transactional emails, like Order Confirmations, Shipping Notifications, and Thank You messages. You can create different Transactional Groups using the web interface or by calling AddTransactionalGroup. Every Group has a numeric ID assigned to it, and so to assign a particular transactional email to a Group, you can set the TransactionalGroupID. Q. How do I send attachments with my transactional email? A. You can specify the names of attachments in the Options input parameter. However, the file names you specify must already be present in your account. You should FTP your files to client.jangomail.com/Attachments prior to calling this method with attachments.